Magneto-endosymbionts (MEs) show promise as living magnetic resonance imaging (MRI) contrast agents for in vivo cell tracking. Here we characterize the biomedical imaging properties of ME contrast agents, in vitro and in vivo. By adapting and engineering magnetotactic bacteria to the intracellular niche, we are creating magneto-endosymbionts (MEs) that offer advantages relative to passive iron-based contrast agents (superparamagnetic iron oxides, SPIOs) for cell tracking. 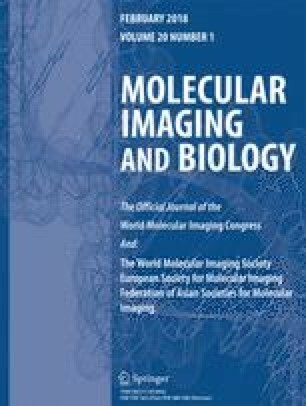 This work presents a biomedical imaging characterization of MEs including: MRI transverse relaxivity (r 2) for MEs and ME-labeled cells (compared to a commercially available iron oxide nanoparticle); microscopic validation of labeling efficiency and subcellular locations; and in vivo imaging of a MDA-MB-231BR (231BR) human breast cancer cells in a mouse brain. At 7T, r 2 relaxivity of bare MEs was higher (250 s−1 mM−1) than that of conventional SPIO (178 s−1 mM−1). Optimized in vitro loading of MEs into 231BR cells yielded 1–4 pg iron/cell (compared to 5–10 pg iron/cell for conventional SPIO). r 2 relaxivity dropped by a factor of ~3 upon loading into cells, and was on the same order of magnitude for ME-loaded cells compared to SPIO-loaded cells. In vivo, ME-labeled cells exhibited strong MR contrast, allowing as few as 100 cells to be detected in mice using an optimized 3D SPGR gradient-echo sequence. Our results demonstrate the potential of magneto-endosymbionts as living MR contrast agents. They have r 2 relaxivity values comparable to traditional iron oxide nanoparticle contrast agents, and provide strong MR contrast when loaded into cells and implanted in tissue. Kimberly D. Brewer and Ryan Spitler contributed equally to this work. The authors would like to acknowledge technical assistance from Adam Shuhendler, Marjan Rafat, Edward Graves, and Rehan Ali, and the support from the following funding sources: NIH SBIR Phase I 1R43TR001202-01, CIRM RT2-02018, and NIH T32-CA-009695. Ryan Spitler was a consultant for Bell Biosystems Inc. Kayla R. Lee, Andrea C. Chan, Joyce C. Barrozo, Abdul Wakeel, Chandler S. Foote, Papia Chakraborty and Bradley W. Rice were all employed by Bell Biosystems during this work. Christopher H. Contag serves on the scientific advisory board of Bell Biosystems. Caleb B. Bell III is the CEO of Bell Biosystems.